Varkala is a little town in the southern part of Kerala and a very beautiful cliff beach. The northern cliff is tourist destination while the southern cliff is Surfer’s Paradise. 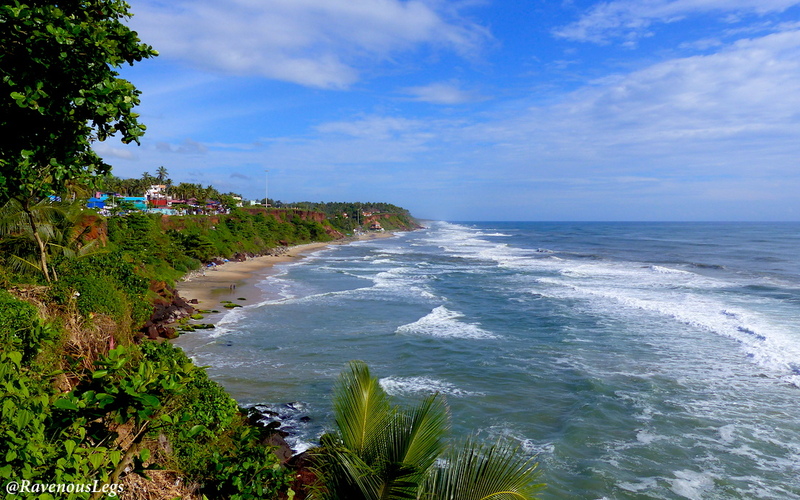 Varkala beach generates waves for all levels of surfers in different seasons. The pre and post monsoon season (Mar-May and Oct-Nov) is the bigger swell season which offers big waves for the professionals. The winter (Dec-Feb) is the smaller swell season which offers perfect small waves for the beginners and practitioners. Varkala is a hidden surfing destination, where the surfers can have the entire coast to themselves. The waves are pristine and the coastline is quiet. This undiscovered southern part of India wins hearts of the soul searching surfers. Soul and Surf is the best surf school in Varkala which is well equipped with internationally trained instructors, comfortable accommodation on individual and sharing basis, an interesting juice bar and cafe and the best outdoor seating to enjoy the soul enriching sunsets. They provide yoga sessions for the inmates and surfers in the evenings. The Golden Beach at the south cliff also provides tranquility to the ones seeking solitude. They have wide range of healthy food for breakfast, lunch and dinner. Soul and Surf makes a perfect combination for the ones who are seeking to cleanse their body and soul while enjoying the sport of surfing. Varkala is the only cliff beach of Kerala. The blue Arabian Sea merges with the clear blue sky. The waves and the clouds give soothing white tinge to the globe. One can spend hours admiring the unparalleled beauty of the beach. Winters is a good time to spot dolphins in this beach while you sip your morning coffees at the rooftops of the cafes on the promenade. Local fishermen are often seen rowing their small boats in the sea for fishing. The northern cliff is very vibrant with people strolling around on the promenade. The promenade offers flea shopping, handicrafts and artefacts, cafes and restaurants. People get down the cliff to the beach for a swim in the day time and enjoy the evenings by the promenade. Varkala caters to backpackers, young couples and people looking to rejuvenate in offbeat destination. Varkala has variety of food options. Luxury dining, chic cafes and themed cafes on the promenade offer sea face dining with delicious items on the menu. Darjeeling cafe offers very good Oriental and Indian food. Cafe Italiano offers good quality Italian food with a unique dining experience which makes you feel like you are sitting on a ship in the sea. Bohemian cafe serves the best organic food, they have plenty of south Indian delicacies too. ABBA offers luxury dining and good European food. It is a pleasant feeling to enjoy the sunset and walk down for some sea facing candle-lit dinners, sensing the cool breeze and sound of the waves. Coffee temple is the most sought after cafe in Varkala. It offers some of the best coffees and baguettes in the town. There are various cafes and guest houses run by foreigners who chose to live in Varkala for longer than just a holiday. There are many options for the Kerala Ayurvedic massages. You can even get trained as a masseur, as they offer courses in massages. There are morning yoga classes for the ones looking to nourish their soul. The Varkala beach gives perfect calm ambiance in the mornings with the rhythmic sound of the waves. Varkala cliff doesn’t disappoint the art lovers too. There are some unique art galleries, handicrafts shops, library and book exchange shops. Varkala provides accommodation of all ranges – budget, mid-range to luxury. There are some pretty guest houses with the sea view. Some villas are converted to guest houses which give a homely feeling for longer stays. The best way to explore Varkala town and places nearby is to hire a two-wheeler and ride on the picturesque roads. The town of Varkala is famous for its temples. The Janardhana Hindu Temple is located at the temple square and is visited by lot of locals and outsiders. Ride a few kilometres away from the town to the most scenic road of Kerala. The road has Kappil beach on one side and the backwaters on the other side. This road runs parallel to a railway track on a bridge on the backwaters. Ride few kms further to the local fisherman villages by the beautiful Edava lake. The best time to travel to Varkala is the off-season (mid-October to November or March) when it is relaxed and tranquil. It gets crowded and expensive in peak season – December-January. Varkala is 50 kms (1.5 hours) away from Trivandrum and 160kms (5 hours) from Cochin. Buses / Trains / Taxis are easily available from these cities to Varkala.